If you have been encouraged to begin sprouting for your birds, congratulations! 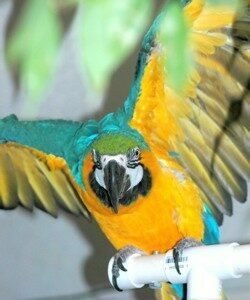 Now let’s look at options for helping your parrots transition to eating this natural food feast you are offering them. If a bird is breeding, or feeding babies, dietary changes must be made slowly. Before we look at several ways of successfully teaching your parrots to enjoy new, healthier foods, it’s important to acknowledge that you are the most important thing in your parrot’s world. And being this important to them gives you an advantage. Even though you may have tried, and been unsuccessful at getting your bird to eat new foods before, I want you to understand that your thoughts and expectations about how your bird will respond are very important. I encourage you to picture your parrot happily gobbling down the new foods you’ll be feeding him. If your response to this suggestion is, “Yeah, right. You don’t understand my bird. I’ve tried everything.” Then let me explain why it is so important for you to focus on the outcome you want to have. 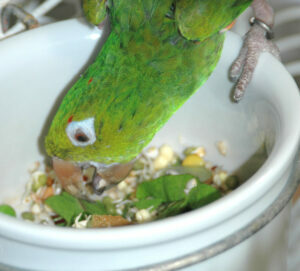 Sir Charles, White-eyed Conure, loves his BBFE sprouts. First of all your beliefs about your bird being able to learn to eat health foods influences your bird’s action more than you may realize. Teaching your bird to eat a balanced selection of wholesome foods is really a matter of life and death for him. And when you think about introducing new foods, and include this added level of importance, many times a person’s love for their parrot will gently inspire them to be more committed in achieving good results with their bird. Another important idea to understand, regarding how you choose to think about teaching your parrot to eat healthier foods, is that the thoughts you think are choices. If you catch yourself focusing on unsuccessful prior experiences, stop those unproductive memories fast! And picture, in your mind’s eye, what it would look like to see your bird diving, beak first, into that beautiful bowl of life giving sprouts! See the ‘bird yum’ residue on his beak. Envision him selecting and eating one delicious sprout after another. Keep this mini motion-picture going in your thoughts your for a minute or two, and repeat this process two or three times a day. In many areas of life using detailed visualizations can be the turning point of changing failure into success. Set a timer, if you must, to help you stay focused on this vital task. Corby exercising on his playpen. Another reason why focusing on the desired outcome you want to achieve with your birds has to do with brain waves. Did you know that dogs, cats and birds have the same brain wave patterns as young children? And did you know that pre-verbal human babies understand the labels, both the positive and negative ones, given them by their parents? It’s true. Child psychologists have documented that children, even those too young to speak, ‘believe’ these labels. And this ‘belief’ has an almost prophetic power, because these kids develop behaviors equivalent to the labels given them earlier in their lives. Since parrots have been identified as having the intelligence level of a two to six year old child, can you begin to understand the power that your thoughts and words can have over your feathered companions? Say No to seeds. All types of seeds. One of the primary symptoms of unbalanced nutrition, malnutrition and undernutrition in a bird, is that this bird primarily eats unhealthy, unbalanced foods. These poor food choices often include all types of nuts and seeds. When a person tells me that their bird will only eat peanuts, for example, I know that we’re facing what may be a very serious case of avian malnutrition. 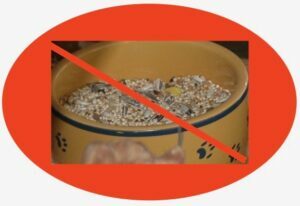 Rather, than have this fact alarm you, I encourage you to make use of the information above regarding how your attitude can influence new, healthier and happier, outcomes for your bird. And please know that once your parrot begins eating healthier foods, using our sprouting blends as the foundation of their balanced food plan, you’ll notice that their ‘addictive behaviors’ towards nuts, seeds and other unhealthy foods, will diminish and eventually go away all together. Then you can remove these items form their diet altogether. I stopped feeding my parrot seeds well before 2007, and when I bring home a new rescue bird, the first thing I do is to begin introducing them to healthier food choices while weaning them off of the unhealthy nuts and seeds. Please let us know how these ideas work for you, make a comment, ask your questions, let us help you have healthier, happier parrots. 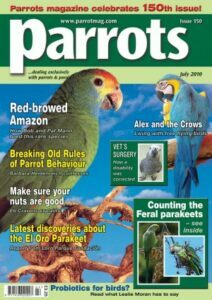 Feeding Parrots: Be Successful When Introducing New Foods – Part 2, will continue this information rich post, especially written to help you succeed.